Acana Freeze Dried Grass Fed Lamb Adult Dog Treats have been made with the finest ranch-raised lamb & okanagan apple. Delicious and 100% natural, your dog will find them irresistable and they're full of the good stuff! These treats have been prepared without cooking or preservatives, Acana treats are gently freeze-dried to lock in their natural goodness and taste. 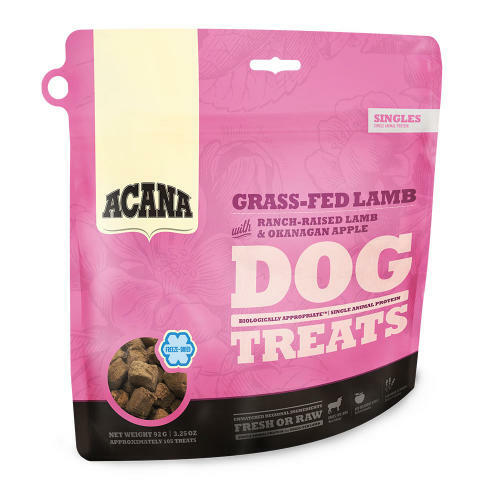 Packed with goodness and full of natural flavour, Acana Grass-Fed Lamb Treats contain one single, easily digestible animal protein and reward your dog according to his evolutionary needs. Raised on New Zealand ranches, our grass-fed lamb is paired with Canadian-grown Red Delicious apples and lavender flowers – all delivered fresh or raw and gently freeze–dried to create a richly nourishing and deliciously satisfying treat.